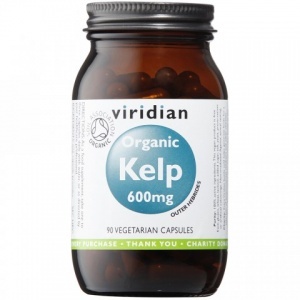 Contains iodine, supporting metabolism and normal thyroid function. Liquid iodine drops as bioavailable potassium iodide in a simple, hypoallergenic purified water base. 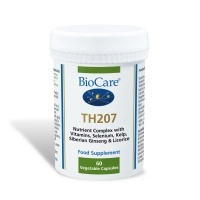 BioCare TH207 contains iodine, glycine, glutamine, tyrosine and siberian ginseng to support healthy thyroid gland function. Higher Nature Thyroid Support Formula (Size 60) - Iodine & Selenium are needed to make thyroid hormones for body's for heat, energy & metabolism. Lamberts Iodine 150mcg. 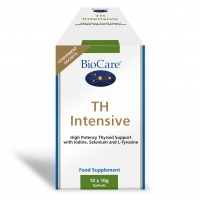 : help for thyroid, metabolism and an aid for growth and development of skin health. 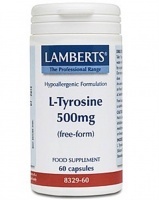 Lamberts L-Tyrosine 500mg, Uses: Important support for healthy brain function. Nutri Advanced Thyroid tabs provide hormone-free thyroid concentrate, to nutritionally support this regulatory gland. Picolinate is a more absorbable form of Zinc. he thyroid gland sits like a bow tie around the front of your neck. It is a vital link in the endocrine system. The thyroid gland secretes two hormones (T4) and the more biologically active T3. Even a small decline in the output of these hormones, if sustained over a long period of time, can have profound consequences for health and well being. The thyroid gland acts as the body’s thermostat and controls the metabolic rate of the body. As metabolism affects every cell of the body, if the thermostat is malfunctioning (either set too high or too low) it naturally affects all parts of the body. If cellular metabolism drops too low, widespread dysfunction of the body can occur and conditions such as depression, anxiety, memory impairments, hair loss, weight gain, loss of libido, fatigue and cold hands and feet can ensue. Michael Schmidt and Jeffery Bland, in a paper published in Alternative Therapies in 1997, explain how there is a very strong relationship between the health of the thyroid gland, the environment and nutrition, and even very subtle changes in the thyroid gland’s homeostasis can cause a plethora of physiological symptoms. Thyroid decline most often affects women over 40 but men and younger people can also suffer. Statistics suggest that up to 20% of the female adult population may have reduced thyroid function, although many practitioners of alternative and complementary medicine believe the figure is far higher. Many people who undertake to have a standard laboratory test for thyroid function will receive results that indicate they have no abnormal thyroid pathology. However, if the same person were to test their basal temperature using the Axillary temperature test (see underactive thyroid), the results would probably indicate the need for nutritional support for the thyroid gland. More and more doctors and practitioners today feel that "normal” ranges of thyroid function are too broad and that the Axillary temperature test, if carried out properly, is a more accurate way of testing for thyroid function. If a person does present with reduced thyroid function the only way out seen by many is for a lifelong prescription of thyroxin hormone. However, nutritional support containing synergistic blends of herbs and nutrients can be successfully utilised in a regime and prevent the patient from descending the downward spiral of ill health. Amino acids play a major role in supporting thyroid health. It is important when choosing supplements of amino acids that they are in the L configuration, or in the case of phenylalanine the DL configuration. This is the form found in nature and utilised by the human body. L-carnitine is made in the body from the amino acids lysine and methionine. Carnitine plays an important role in the metabolism of energy from fat. In order for carnitine to be utilised fully it requires vitamin C, iron, niacin, B6 and methionine. See L-Carnitine product. DL-phenylalanine is a mixture of the amino acid L-phenylalanine which is converted in the body to L-tyrosine. D-phenylalanine is converted primarily to phenylethylamine which is a mood elevating chemical in the body as well as helping to influence certain chemicals in the brain which relate to the sensation of pain. By taking DL-phenylalanine, levels of tyrosine are increased and hence this can influence levels of thyroid hormones. Several nutrients are required for the conversion of phenylalanine to tyrosine; these are vitamin B6, iron, vitamin B12 and vitamin E. See phenylalanineProduct. 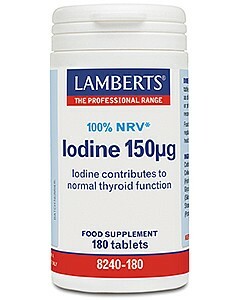 There are many minerals essential to the health of the thyroid gland; the most well researched is iodine. Iodine is required to manufacture the thyroid hormones. Seafoods, iodised salt and sea vegetables such as kelp, as well as foods grown in iodine rich soil, are rich sources of iodine. With today’s intensive farming techniques it is thought that trace minerals including iodine have been depleted and so many foods no longer contain substantial amounts of these trace minerals. Iodine has now been added to salt and therefore people eating a large amount of processed foods may be consuming too much iodine. 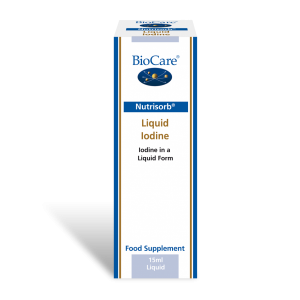 However, people whose diets are low in sources of iodine may well benefit from taking supplements of this mineral to help support optimal thyroid health. Zinc is another essential mineral for optimising thyroid health. In a study of fourteen healthy people with primarily high or low serum zinc levels, thyroxin levels tended to be lower in those people with lower serum zinc. By supplementing with zinc in those individuals whose serum was low, thyroxin levels increased. There are many different zinc supplements available today and some are absorbed by the body better than others, one of the best sources being zinc picolinate. Selenium plays a role in thyroid hormone metabolism. It is now thought that severe selenium deficiency may be a possible cause of goitre. In relation to thyroid health copper is another mineral which plays an important role in the metabolism of the amino acid tyrosine. Although copper deficiency is uncommon, people taking zinc supplements for more than a few weeks should take copper (unless they have Wilson’s disease) as zinc interferes with copper absorption. The safest way of ensuring balance is to take a good quality multivitamin and mineral supplement. Manganese is required to transport thyroxin hormone in the cell. Intracellular conversion of T4 to T3 is known to require zinc, selenium, copper and iron. The production of T3 is dependent upon vitamin A. Stress is known to affect thyroid function. The amino acid tyrosine is necessary for the production of steroid hormones adrenaline and noradrenalin. When the body is under stress more of these hormones are required and tyrosine reserves are depleted, leaving the thyroid hormone pathway under functioning. Stress depletes many of the essential nutrients required for thyroid function – the B vitamins, vitamin C, zinc and selenium especially. Individuals who are stressed may therefore require additional adrenal support in order to improve their thyroid function. There are many nutrients and herbs, which can help support the adrenal glands.